I tried to browse the internet, but couldn't find enough sattisfying sources. Are the 5,25 m you list him with valid? Based on pure physical talent Dan O'Brien is the ultimate decathlon benchmark. His personal records therefore to me are the most important ones of any decathlete so far in history. Since I couldn't find any result better than 5,20 m, does anybody has any source to confirm the 5,25 m pole vault he ist listed with here? Dear Janek, I've found a date for the (wind assisted) 8,11 m of Dan O'Brian in the long jump: 11.05.1991 in Modesto. Still no date/ confirmation regarding the 5,25 m he is listed with in the pole vault? Dear Janek, and finally the last piece of the puzzle (5.25m pole vault) has been confirmed. Dan's PR in the vault (5.25m) came at the Spanish nationals inAugust, 1991 in Barcelona. He did 4 individual events while 3 other Americans (I think Fucci, Janvrin and Huff) competed in the Spanish national decathlon. He never bettered that later in his career. Hope this helps. 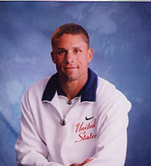 Tomaš Dvorak is triple Decathlon World Champion (1997, 1999, 2001) and a former World Record holder (8994 points scored in Prague 1999). Ashton Eaton is World record-holder for the indoor combined-events discipline.